It’s not that tricky, actually. 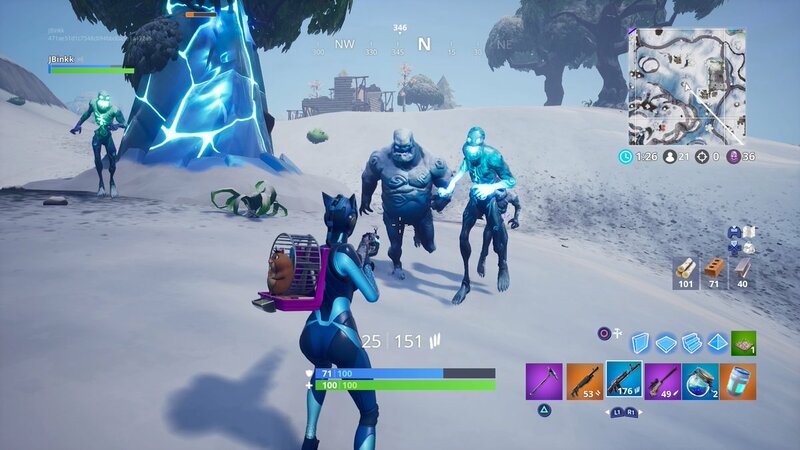 Following today’s event in Fortnite, Ice Storm challenges became available in the popular battle royale game. The first two challenges are pretty simple, but they might be a little tricky for anyone who doesn’t understand the terminology. One requires you to destroy Ice Fiends, while the other asks you to deal 5,000 damage to the Ice Legion with explosive weapons. But what exactly is the “Ice Legion?” Well, the Ice Legion includes any of the zombie-like creatures that are spawning around the Fortnite map right now. There are three different types of Ice Legion creatures. The biggest one is called an Ice Brute, while the tall, skinny creature that throws snowballs at you is an Ice Wraith. The Ice Fiends are the smallest and weakest zombie-like enemies. So, all you have to do to complete this challenge is deal 5,000 damage with explosive weapons to any of the zombie-like creatures that spawn during the Ice Storm event. Utilize grenades or any of the weapons that use rocket ammunition to complete this task. After you’ve done this, you’ll receive 500 XP.